With the end of August practically here, I'm ready for fall to come! Chicken Pot Pie is a comfort food in our house, especially when the fall weather comes around. Just thinking about tender pieces of chicken breast floating around in a silky sauce with mushrooms, peas and carrots, all covered in a buttery and flaky crust makes me even more anxious. Since I can't speed up time, I figured I could take all the delicious parts of a chicken pot pie and incorporate them into a meal somehow. 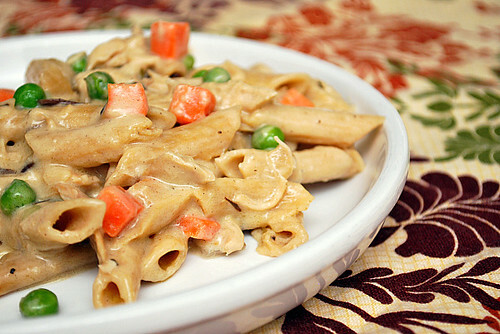 Pasta is always a great ingredient to build flavors upon and as a result, this Chicken Pot Pie Penne came about. 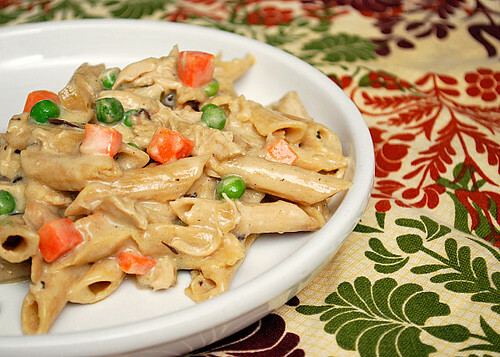 By preparing a simple chicken pot pie filling on the stovetop and combining it with whole wheat penne pasta, I had myself a delicious taste of fall that I can enjoy any time of year! Cook the pasta according to package directions. When done, place hot penne pasta in a large bowl and set aside. Melt the better (or oil if using) in a large skillet over medium high heat. Cook onion, garlic and mushrooms in the skillet until golden brown. Sprinkle in the flour over the mushroom mixture in the skillet and stir. Cook for a few seconds to rid the floury smell then add the broth, half & half (or heavy cream) to the skillet. Deglaze the skillet, scraping up any bits of fond at the bottom of the skillet. Reduce the heat to medium low and simmer, uncovered until the liquid is slightly thickened. Add the chicken, frozen peas and carrots mix, lemon juice, and thyme to the skillet. Cook until heated through and season with salt & pepper to taste. Place the hot penne pasta into the skillet and toss to combine. Add the cooked penne pasta and toss to coat pasta. Serve hot. What a great idea!! I'm loving it and looking forward to making this dish soon. Thanks for the post. This looks like a great weekday recipe! My husband is always asking for chicken pot pie so thanks! Your photo caught my eye on FoodGawker! I'm so making this for my boy... it looks soooo good! I've made this twice now for my boyfriend and our roommates, and it is definitely one their favorite dishes. Thanks so much for this great idea!! I made this for a friend who recently had a baby. I didn't want to do the ordinary spaghetti or baked ziti. I came across this recipe of yours and would definitely add it to one that I will keep making for my family and for others! Easy, delicious and a good twist on a classic comfort dish! Made this tonight! Very yummy! I was craving pot pie but didn't have the patience to make the pie crust, etc. Thanks for the great recipe! I still make this recipe as a meal for friends and family and it's such a huge hit!